Home Issues Animals Quest for Father – Give Dad a Manatee on His Special Day! Quest for Father – Give Dad a Manatee on His Special Day! Aaron adopted Ariel for his dad from Save the Manatee Club’s adoption program at Homosassa Springs Wildlife State Park in Homosassa, Florida. The park is a rehabilitation facility for manatees who are recovering from injuries before being released back into the wild. However, Ariel is one of five females in the Club’s adoption program at Homosassa who currently cannot be released because of past injuries or for other life threatening reasons. Because the park is Ariel’s home year-round, those who have adopted Ariel can visit her at the park and, most anytime, have the opportunity to see how she’s doing. “I adopted Ariel for dad because she’s described as a friendly manatee who smiles at visitors,” Aaron said. Thirty-two manatees are up for adoption in Save the Manatee Club’s three Florida adoption programs at Blue Spring State Park in Orange City, Tampa Bay, and Homosassa. For a $25 tax-deductible donation – which works out to a little over $2 a month for a year – gift recipients receive an adoption certificate, a color photo of a real, live Florida manatee, biography, and a handbook brimming with manatee facts and information. And shipping is free. The adoption package also includes a subscription to the Club’s quarterly newsletter, The Manatee Zone, and the bi-monthly e-newsletter, Paddle Tales. And this Father’s Day, each new member who joins the Adopt-A-Manatee program online for a $35 tax-deductible donation, will receive the Club’s official T-shirt with a beautiful full color underwater design by renowned artist, Nancy Blauers, whose artwork is also featured on Florida’s new official manatee automobile license tag. And if you really want to evoke that twinkle in your dad’s eye, you can also enter the Club’s donation drawing to name a baby manatee after him. Go to https://www.savethemanatee.org/ to find out more. Aaron has fond memories of visiting his grandmother in Miami Beach when he was younger. It was where he first learned about the good-natured, laid-back marine mammals who inhabit Florida’s waterways. Today, there are about 3,000 manatees concentrated year-round in the Sunshine State. Tragically, the largest known cause of manatee deaths is from boat strikes. Whenever a manatee is adopted from Save the Manatee Club, funds raised go toward numerous conservation and education programs. The national, nonprofit advocacy organization was founded in 1981 by signer/songwriter Jimmy Buffett and former U.S. Senator and Florida Governor, Bob Graham. 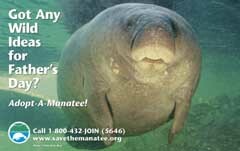 To adopt a manatee for Father’s Day, or to make a donation, contact Save the Manatee Club at 500 N. Maitland Ave., Maitland, FL 32751, call 1-800-432-JOIN (5646), or visit their web site at www.savethemanatee.org where you can also sign up for the Club’s free e-newsletter. Why Wild Horses Are Dying in Navajo Nation?